The snow is still pouring down. It is really amazing how as a child I would wish for snow all the time, but now that I’m an adult and actually have things to do, I just wish for summer. I missed my training appointment yesterday due to inclement weather and I had planned on going to kickboxing this morning, then to film with Missy Kane for her Fit and Fun tv show. Thanks to the snow, all of these things were nipped in the bud. Hopefully some of the snow will melt and I can make it out for our appearance on Live at Five at Four today. See that? 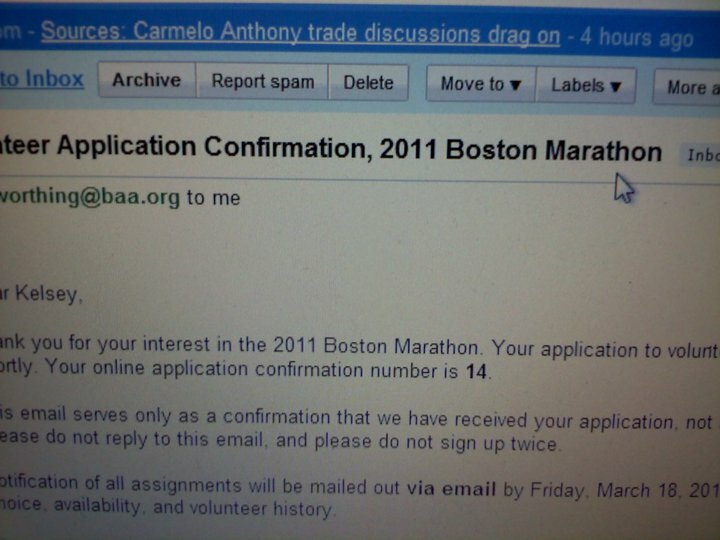 That is my confirmation email for volunteering at the Boston Marathon this year. The most famous marathon in the world falls on my birthday weekend, so I thought it would be a great thing to apply for. I set my alarm to get up early just so I could have dibs on being on of the first applicants. I was number 14. Go me! But volunteers get a behind the scenes view of how everything works, and they also get to see the elite who run in the front. Every volunteer gets to go to the post race party and they even get an Adidas volunteer jacket. I love the idea of all the race perks, but no sore legs. I will know on March 18 if I got picked or what I got picked for. Hopefully in three months, I’ll be Boston Bound.